Tap and hold to zoom in. We're sorry... This shed is not available in your area. Would you like to try a different zip code? Great News! 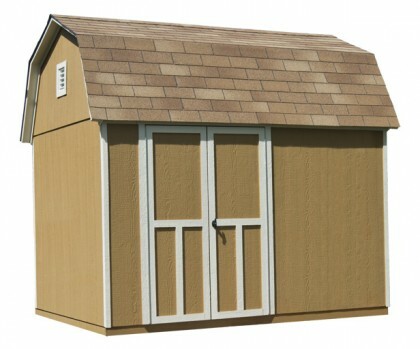 This shed is available in your area! Select a shingle color below. Actual colors may vary from samples shown. 35% stronger than our standard floor. Highlighted by generous overhangs and country-esque styling, this 10x8 storage barn will add extra charm to any backyard landscape. With 698 cubic feet of interior space and 6'4" tall side walls, storing lawn mowers, tools, equipment, tractors, bicycles and other equipment is easy. 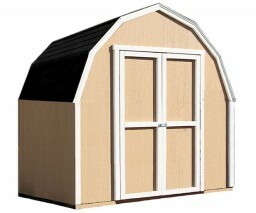 The strong 2x4 frame allows you to easily customize your shed with shelves and a workbench to meet your unique needs. Just choose a shingle color to match your home and unique taste and our professional installation crew can handle the rest. Country of origin: Hand-crafted in the U.S.A. Double door opening: 48" W | Height: 72"
Maximum wind resistance: 90 m.p.h. Paint required: Siding & Doors: 2 gal. | Trim: 1 qt. Your local building authority may have specific requirements resulting in additional cost. Prices do not include painting, staining, permits, zoning and setback advice and/or compliance, excavation, or leveling beyond 6". All prices and content are subject to change without notice. Promotions are valid with online transactions only and cannot be used in conjunction with promotions at a servicing sales/distribution center or distribution center. Not valid on prior purchases. All stated sizes are nominal dimensions and approximate. Some buildings may be shown with optional items. Additional mileage charges (if applicable) and taxes will be calculated after checkout process is completed. 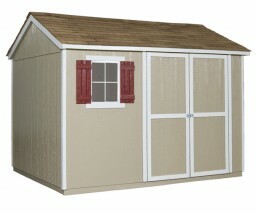 Painted 10 x 8 storage barn is a representation only, arrives primed for painting in a light beige color. This product hasn't received any reviews yet. Delivery was fast, installation was professional and a I could not be happier even a year after the purchase. Built On Site, Excellent Shed! My yard has privacy fencing all around it, so I really need someone to build me a shed on site. This company built me a nice, big shed in a single day. The contractor who did the work was terrific! All I had to do was paint it. I am VERY happy with the finished product. Learn about our storage barn installation process here. 3' of clearance around your entire wood shed is required. 4' if larger than 160 sq. ft.
We will install on concrete slab in place of wood floor. Slab must meet size and level requirements. No price adjustment or floor materials will be given due to additional labor and concrete anchors required. 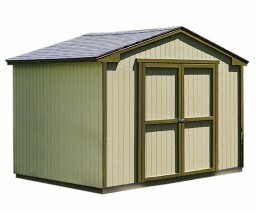 View our other shed selections. Choose the size and style to fit your needs.